Since my last update in mid-late October, I’ve chosen the photos for the eight-page section of color photos, and also rounded up and sent in over 30 more photos to use in the spaces at the ends of chapters, where they finish high up the page. By this point I’ve pored through our photo collections so many times I no longer knew which ones were in the text, which were in the color section and which remained available, so I had to scroll through the proof to check each one. That took a while. The book goes to press in just over two weeks, on November 28, and that will be a great day. – Not as great as publication day will be, but a very significant day in its own right! 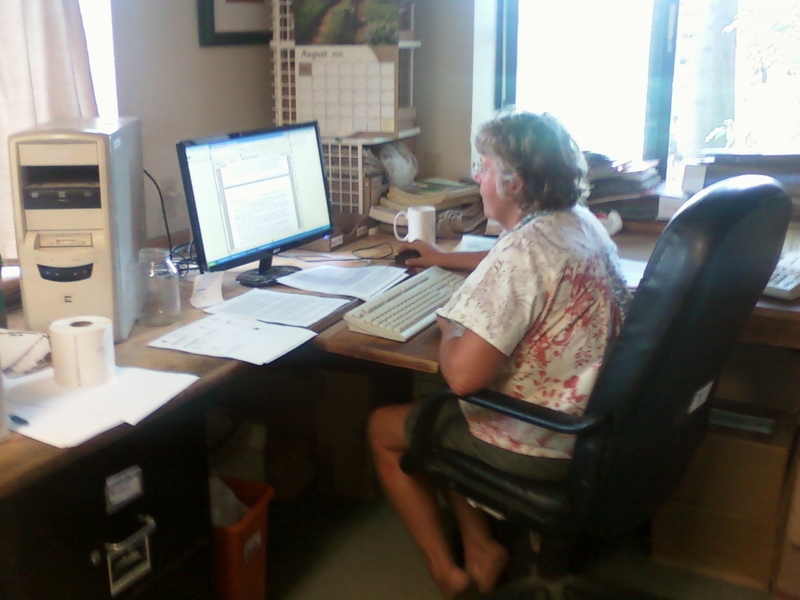 Various kind and knowledgeable gardeners, researchers and teachers of organic gardening and farming have read the electronic proofs and written some encouraging praise about my book, for the cover, and Lynn Byczynski, the editor of Growing for Market, is writing the foreword. My workshop on growing garlic at the Carolina Farm Stewardship Association Conference went well, and the slide show is on www.slideshare.net. It is tagged by cfsa12, cfsa 12, growing garlic, for people to search. I’ve got several more powerpoint presentations to prepare for. 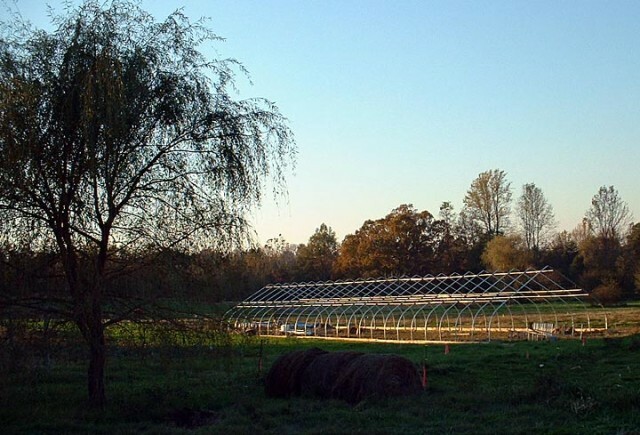 I’ll be at Southern Sustainable Agriculture Working Group Conference in January presenting parts of three workshops. 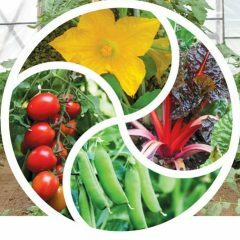 One on my own on Producing Asian Greens for Market; one co-taught with Edwin Marty of the Hampstead Institute, Alabama on Intensive Production on a Small Scale; and as part of a panel on Integrating Organic Seed Production into Your Diversified Farm: Is it Right for You? The book will get printed in during December and the publication date is February 1, 2013. I’m excited! And tired! Author farmerpamPosted on November 13, 2012 Categories Book Updates, farm planningTags August garden, book, carolina farm stewardship, Carolina Farm Stewardship Association Conference, chapter headers, Crop Rotations for Vegetables and Cover Crops, Edwin Marty, farming, gardening, growing for market, growing garlic, growing garlic slideshow, Growing Great Garlic, Hampstead Institute, Integrating Organic Seed Production into Your Diversified Farm, Intensive Production on a Small Scale, Lynn Byczynski, new society publishers, Planning for Successful Sustainable Farming, Producing Asian Greens for Market, proof-reading, publication date, southern sustainable agriculture, Southern Sustainable Agriculture Working Group Conference, vegetable growing, Virginia Biofarming Conference, www.slideshare.net. When we have massive big harvests, it’s hard to get much else done on the garden shifts. 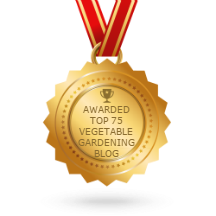 This week we’ve made a lot of progress on the two big projects of the broccoli patch and the carrot thinning and weeding. The whole of the broccoli and cabbage patch except the very edges has been cleared of weeds. After tilling the edges, the next job there is to broadcast a mix of medium red clover, large white clover and crimson clover, and water it in until it germinates, if nature doesn’t deal with that. Hurricane Isaac is forecast to curve round towards Virginia by the middle of next week, but lots can change with weather systems. If all goes well, we’ll get the clovers established before we need to start walking in there harvesting (usually mid-September onwards). This fall (as I reported in my post on July 5) we are taking part in the Novic broccoli variety trials, growing twelve different kinds of broccoli and eleven of cabbage. We have received our report sheets to write down our data and comments each time we harvest them. We’ll benefit from the comparisons and next year just grow the best varieties. We want varieties that provide a long broccoli season, and sideshoots are as important to us as main heads. Quantity and flavor are important to us as well, of course! 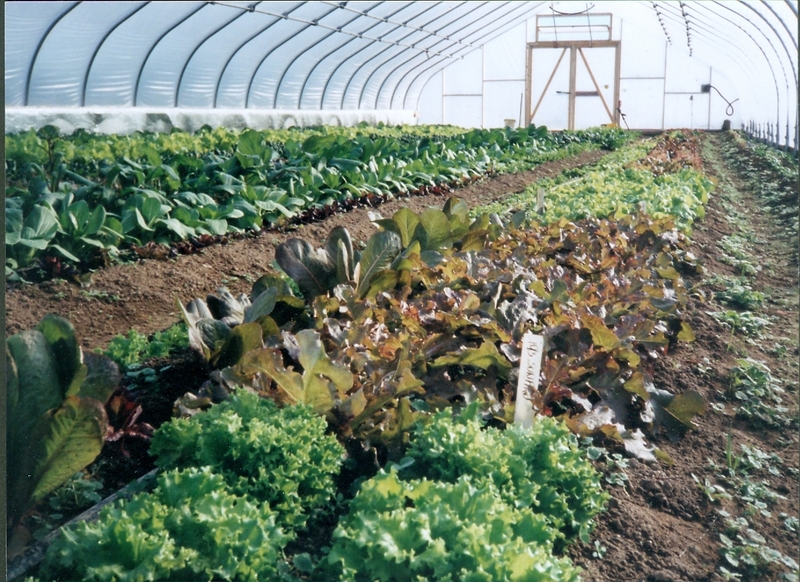 We want cabbage to store for the winter, as well as cabbage that is ready quickly. We’re feeding the hundred members of Twin Oaks Community, and just about everyone here likes broccoli and cabbage. George Bush would be out of place! 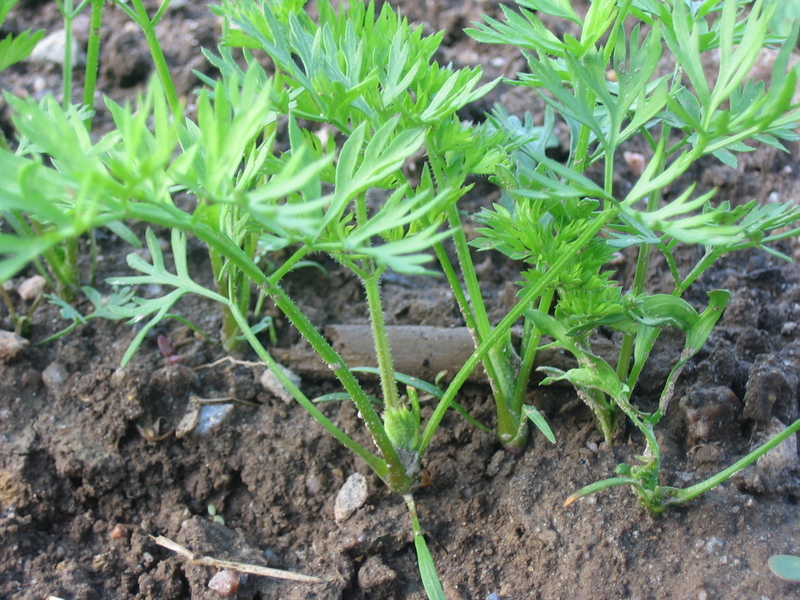 The carrot thinning is making good progress. From the top of the 265′ rows, it looks like we are very, very close to the end. There is what I call a “curvature of the earth effect”: when you walk down there to weed, you see we’re not as close to the end as it seemed. But – the end is in sight! Next, we’ll hoe between the rows, then leave this crop alone until the baby carrots are salad size. Then we’ll weed and thin again, this time to 3″. And we’ll be able to eat those tender little carrots! Then we’ll leave them alone again until November, when we dig and bag them all. So, now we can look at other projects. We are removing rowcover from the crops we sowed at the beginning of August. Today we uncovered a bed of turnips, one of squash, one cucumbers and three kale. In the next few days we can weed and thin those. 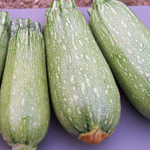 In fact I already thinned the big squash plants as I walked by on my way to the hoophouse after lunch. I just couldn’t resist! 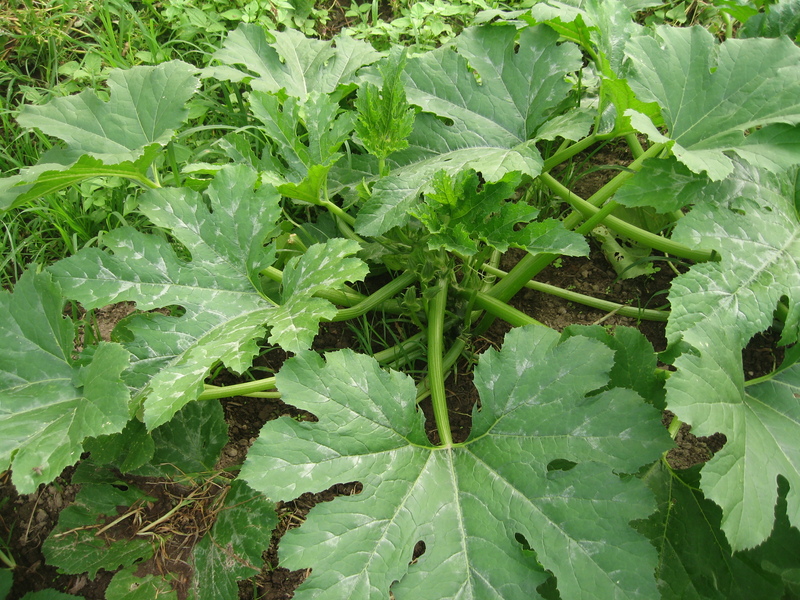 The plants, sown on August 5, are already two feet tall, pushing at the rowcover. I thinned to about 18″-2′ apart, and also pulled out a few handfuls of galinsoga, our most common summer weed in the raised bed area. One of the signs we look for in deciding whether the season is cooling down enough to sow spinach is the re-emergence of the cool weather annual weeds, especially dead-nettle and henbit. I usually look for them while harvesting paste tomatoes, as that soil has not been disturbed for a while. I saw seedlings of one or other of these key weeds on 8/18 this year, a bit earlier than usual. We were certainly having cooler nights and even cooler days, so it all felt right. This morning we prepped four beds for spinach. The beds had just been tilled yesterday afternoon with our walk-behind BCS 732, and today we shoveled paths and raked the tops. We’re due to sow 5 beds of spinach on Saturday (9/1), and I’ve already got the seed sprouting in a plastic jar in the fridge. 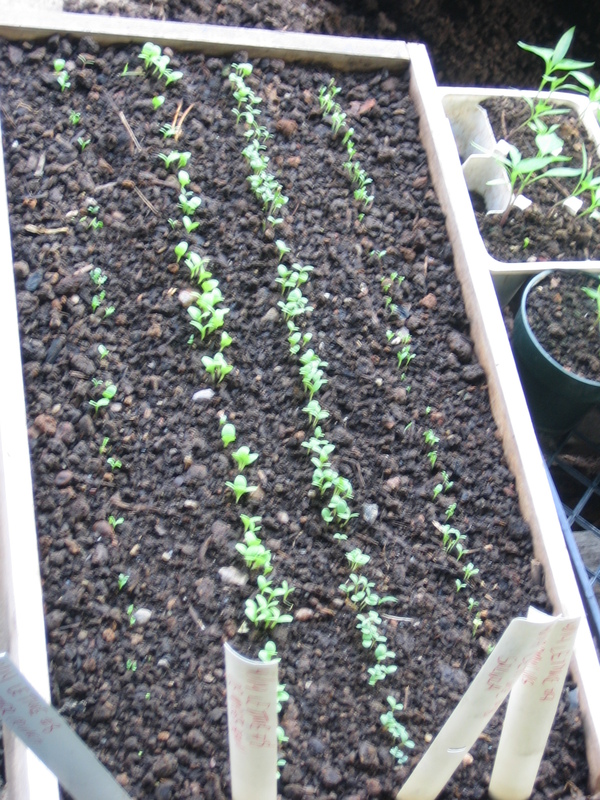 It’s hard to get spinach to germinate in hot weather, so we always pre-sprout in the fall. Just soak the seed overnight, then drain and put the jar in the fridge. I go by once a day to roll the jar so all the seeds get a chance of light and moisture. It’s not much work while they’re sprouting. Hand-sowing is a bit more fussy. Sometimes the damp seeds clump together, so we mix them with a dry, non-sticky food item like dry grits, oatmeal or bran. We mark five rows in each bed, and sow spinach in the outer four. in spring we sow snap peas in the middle row, and get double value from the bed, the weeding we do, and the winter rowcover. 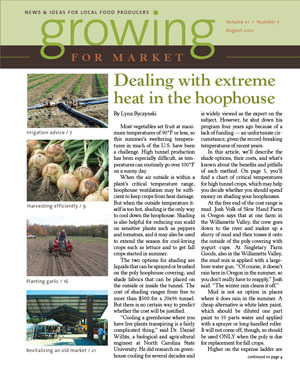 After the flurry at the beginning of August to get the last warm weather crops sown, we’re now focusing on cool weather crops to feed us in the winter. We sowed 4000 ft of carrots (Danvers 126) on August 4th, flamed them to kill the weeds that came up before the carrots, then hoed between the rows last week. This week we’ve begun the slow job of hand weeding the rows and thinning the carrots to an inch apart. 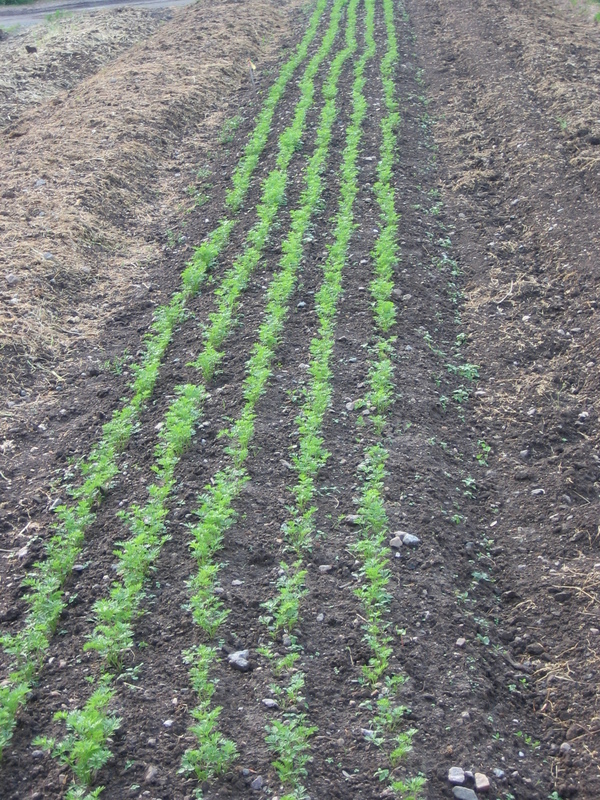 At 4000 ft of rows, that’s 48,000 carrot seedlings to keep and thousands more weeds to remove to ensure the carrots’ happiness! Fortunately, we get faster at this skill with practice. We’re using marker flags as we go down the rows, to show where to start next time. It’s fairly obvious while the plants are all so small, but the flags also serve to measure our daily progress. After this thinning, we won’t come back till the carrots are big enough for salads, when we’ll thin to 3″ apart. 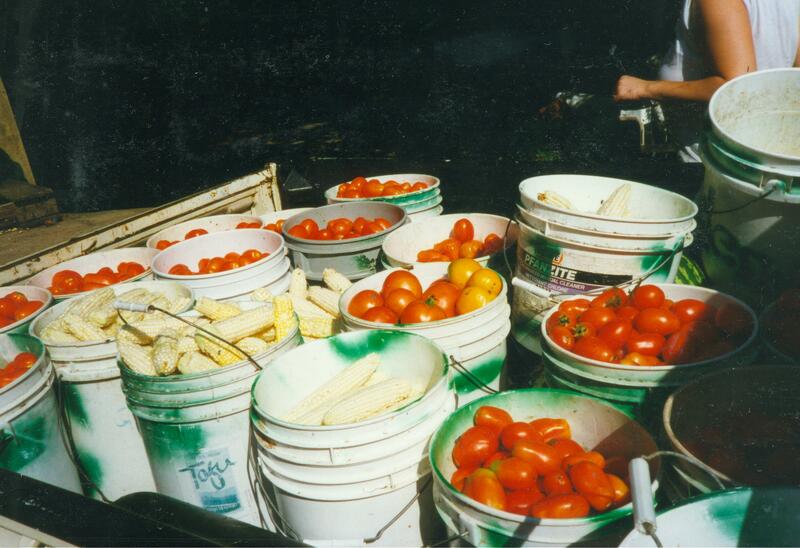 Then we’ll do the big harvest, washing, sorting and bagging, in November. 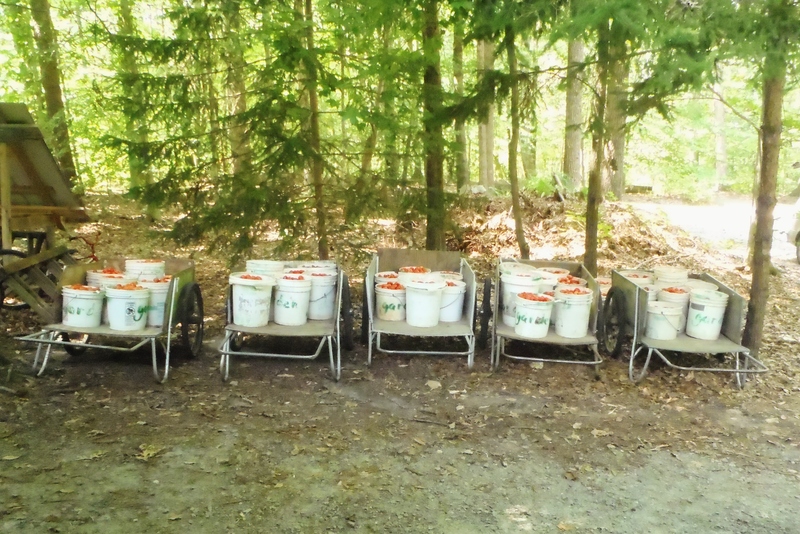 We hope for at least 30 fifty-pound bags to see us through the winter. Last year and the one before, we fell behind with the weeding and had to abandon part of the plot. As always, we resolved not to repeat the same mistake two years running! We’re certainly off to a good timely start this year. And as a result of learning from last year’s mistakes, we decided to try overwintering a bed of later carrots (we’ve just sowed those). Last year we took the desperate measure of mowing the part of the plot we couldn’t weed, to stop the weeds from seeding. To my surprise, the carrots grew back! They were promptly named the Zombie Carrots. They survived the winter and grew into edible size. Sure, they never got big, but the flavor was especially sweet, in the cold weather. Previously we avoided overwintering carrots because of problems with voles tunneling underground and eating roots of whatever they could find. This winter we’ll test which wins: carrots or voles. Finding time to weed carrots wouldn’t be so hard if it was the only task on our list. Not so. (If carrots lose out, the best we can hope for is Zombie Carrots!) We are also tackling (larger) weeds in the (larger) fall broccoli. 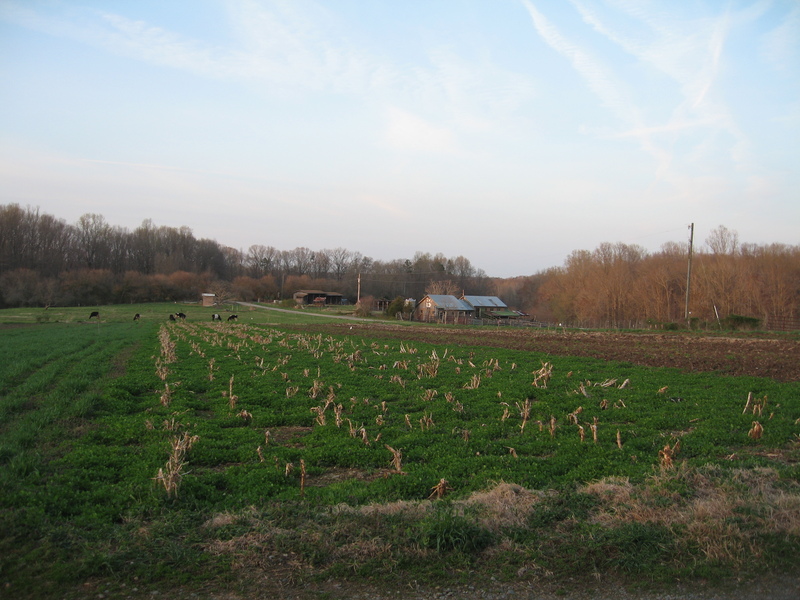 Our plan is to remove the weeds, then broadcast a mix of medium red clover, large white clover and crimson clover. If all goes according to plan and the clover seed gets enough rain or overhead irrigation, it will grow slowly over the fall and winter, and then take off in the spring when the broccoli is dead. 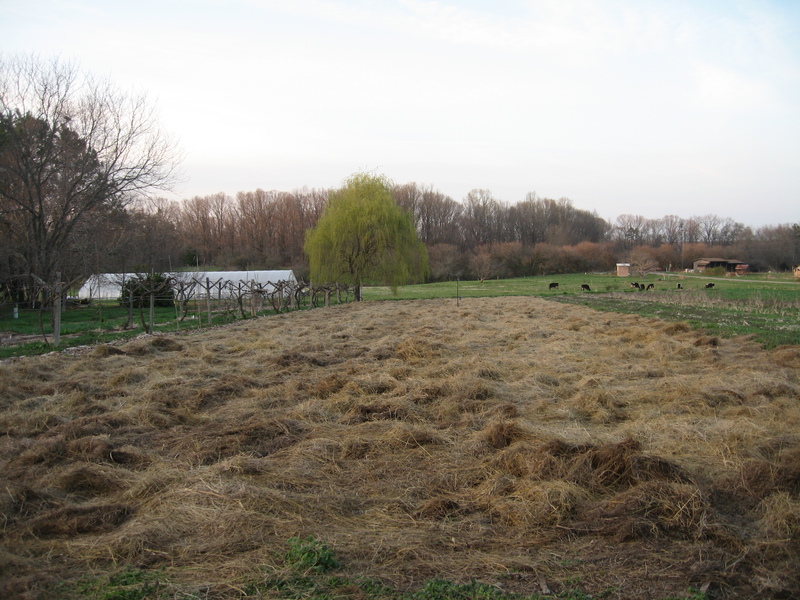 We’ll bush hog the dead broccoli in spring and leave the clover growing for the full year to replenish the soil, just mowing from time to time to control annual weeds. When it works, it’s great. But we have to get rid of the weeds soon, to give it a good chance of success. So this weeding competes for our attention with the carrot weeding. Happily, they are different types of work: patient detailed work or energetic, vigorous pulling or hoeing. Some weather conditions suggest one job over the other; some people prefer one type of work over the other. 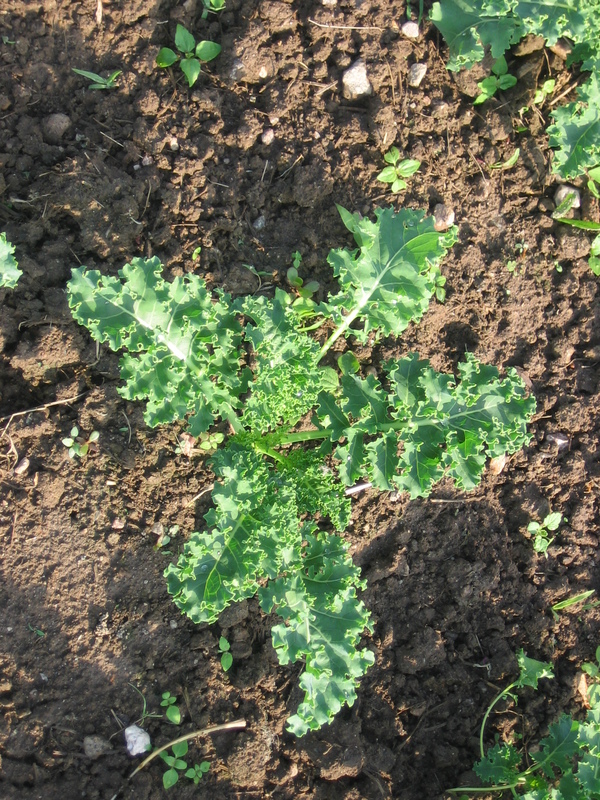 The broccoli weeding makes a good energetic start to the morning, when conditions are damp and chilly. The carrot weeding makes for a more mellow finish to the shift. And it all makes a change from harvesting 52 buckets of tomatoes!